Our Level 2 Maths online study resources provide a vocational approach to maths, helping to boost confidence and motivation for learners who’ve had limited achievements in the subject. They’re equally useful for year 9 and 10 learners to build on their practical maths skills or as a year 11 ‘rescue’ option for struggling and ‘hard-to-reach’ learners. 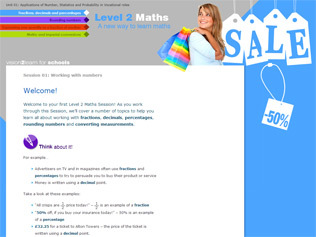 Upon completion of these Level 2 Maths learning materials, learners can use our Functional Skills Maths resource to deal with real-life scenarios alongside practical tasks to help them practise and apply their maths skills. In these resources, learners will need to work through two units. Each unit is divided into a number of manageable study sessions.